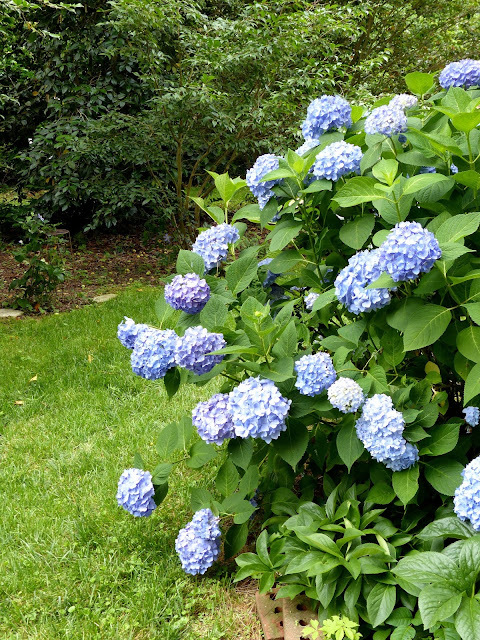 If you love hydrangeas, come hear Robert Mallet! There were many highlights on the our trip from Paris, where we had stayed in an apartment in the Marais for a week. We first went to a very crowded, but floriferous Giverny, then made our way to the D-Day beaches. There, we got to see the end of a Memorial Day ceremony in the American cemetery. We all shed tears. Our ultimate destination was Varengeville-sur-Mer, where a visit with Robert and Corinne Mallet turned out to be the perfect ending for the trip. I had had the pleasure of meeting the Mallets, arguably the two most knowledgeable people in the world on the subject of hydrangeas, when they came to Atlanta. Penny McHenry, founder of the American Hydrangea Society, had arranged for several of us to visit nurseryman Eddie Aldridge in Birmingham so the Mallets could see oak leaf hydrangeas in their native habitat. We also saw the Aldridge Gardens in Hoover, where Eddie had planted rows of Hydrangea quercifolia 'Snowflake', the double-flowering oak leaf Eddie's father had introduced to the world from where the plant was found in an obscure corner of Alabama. Back to France: My daughters were charmed by Robert, who took us on a wonderful tour of his family's ancestral manor house and the extensive gardens begun in the late 19th century by his grandfather. I have photographs of my daughter in front of towering rhododendrons in full bloom. Then, we drove to a two-hectare (just under five acres) field. We got out of the car and walked around to see only some landscape cloth stretched out, with a few newly-planted hydrangeas (only identifiable by the emerging leaves) in an otherwise empty space. 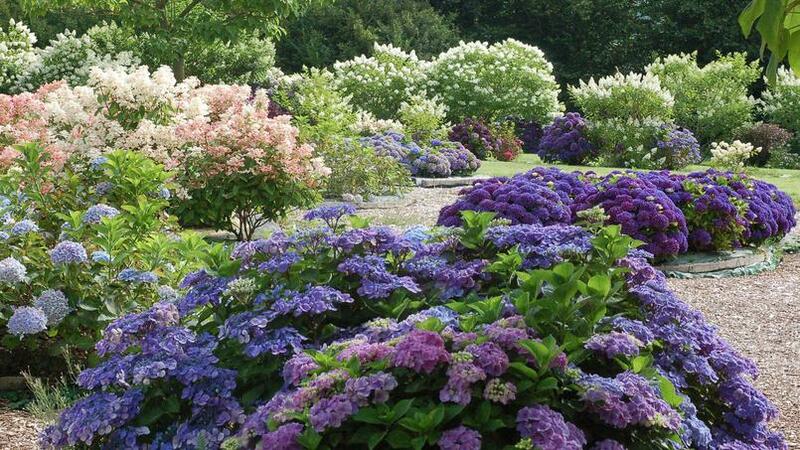 Robert told us about the plan for a glorious garden, which would house a collection of hydrangeas from around the world. He and Corinne would plant fast-growing paulownia trees to provide shade. I couldn't picture this because for us in Georgia, this is rather an aggressive, not-too-attractive tree that can pop up in unwanted places. Robert assured us that this was not the case in France, that the large leaves would quickly provide cover for those hydrangeas needing shade. I have to admit that I could not picture any kind of garden in this blank field, although the surrounding countryside, with gentle, rolling hills was lovely in the fresh burst of spring. Today, 11 years later, that lonely-looking field is a paradise of hydrangeas. Visitors coming from all over the world are awe-struck by the glowing colors and the magnificent blooms of every shape and size along the maze of trails meandering through the five acres. Robert Mallet will be at the Atlanta History Center on Monday, October 23rd, to give a presentation on the Shamrock Collection, now the largest and most extensive assemblage of hydrangeas in the world. The title of his lecture: The Ultimate Exhibitionist: Hydrangeas from Private to Public. American Hydrangea Society meetings begin at 7 p.m., with refreshments and time for buying raffle tickets for a wonderful array of hydrangeas. The lecture will begin at 7:30 p.m. in the Woodruff Auditorium located in McElreath Hall, 130 West Paces Ferry Road, N.W., Atlanta 30305. The last time Robert addressed the American Hydrangea Society, I left with my heart beating wildly, wanting every hydrangea I saw in this notable collection. His charm and enthusiasm are infectious, making him the perfect spokesperson for this genus of plants that has brought beauty and joy to so many gardens around the world. Entrance to Robert's family's manor house, La Maison du Bois des Moutiers, designed by Edwin Lutyens. Those are hydrangeas in the terra cotta pots. You can see Clematis montana 'Alba' in bloom in the enfilade. A Lutyens bench, of course. Windows of the manor house festooned in clematis. 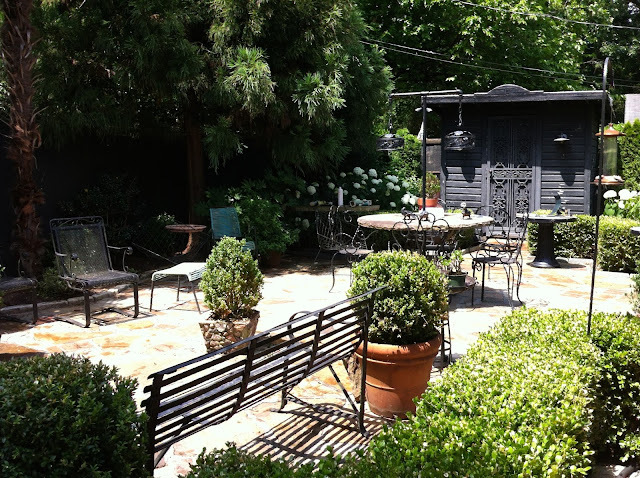 Note: The photograph at the top of the page shows giant-flowered hydrangeas at Amy Linton's house in Peachtree Hills in Atlanta. On Sunday, October 22, 2017, yet another award-winning documentary film edited by Amy - Robert Shaw - Man of Many Voices - will make its Atlanta debut at the Rich Auditorium at the Woodruff Arts Center., 1280 Peachtree St., N.E., Atlanta 30309. The time is 4:00 p.m., and tickets are $10 general admission. The fascinating story of a great man, plus beautiful music. I have to brag that Amy edited A Gardener's Diary on HGTV, produced by Kathryn MacDougald and me, and starring Erica Glasener. Now, Amy is even more big time, with many acclaimed documentaries to her credit. http://robertshawthefilm.com for information and to purchase tickets. 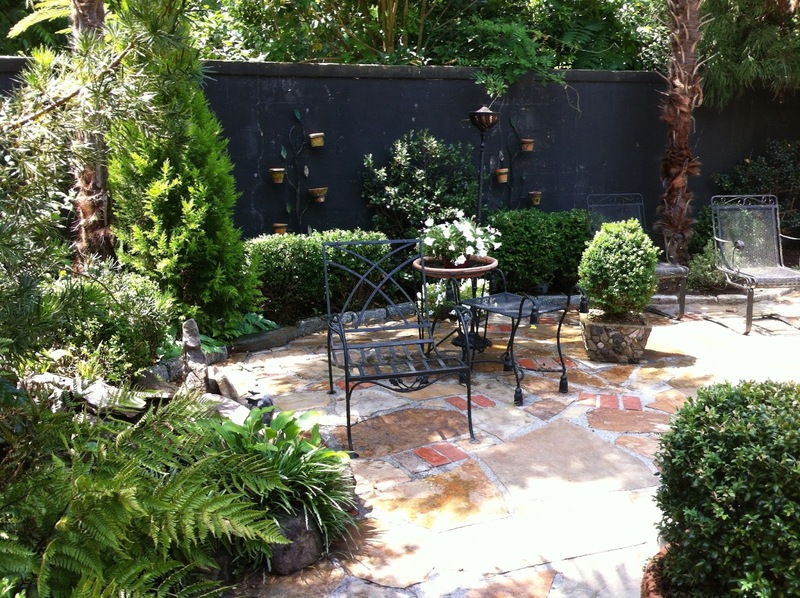 I have a longtime, cherished friend who often has me come and give her advice about what to do with her yard. Not once has she taken any of my suggestions. It's actually pretty funny, and it doesn't hurt my feelings at all. I do have to say that I kept suggesting a pair of boxwoods to flank her front door, and she kept saying she didn't like boxwoods. She later hired a garden designer (I am not one, by the way) who got her to plant two boxwoods by the front door. They look great. The last time I was over, she was concerned about a blank area on the white brick wall on the back wing of her house. In an instant, I could see it. An espalier on the wall, then a four-foot-wide space for some perennials for cutting, mixed with low-growing, flowering shrubs. All this to be outlined with a hedge of dwarf boxwood, sheared as the one is above, to form a border and give a neat, controlled look. "I don't like little hedges," she replied immediately. "Oh," I said, and sort of chuckled to myself. Here was yet another of my suggestions dismissed forthwith. I was sure the design I had in mind would answer all her concerns, but it wouldn't work without the low hedge. Take, for example, the scene pictured above. There's a lot going on behind that low box hedge. Without something to keep the chaos all in, I don't think the yellow flower garden would be as attractive. But, then, I am obsessed with hedges of all heights. I love them. For over a year, I have been looking at the only space that receives sun in front of my house (besides the parking area, which is blazing hot in summer). I have designed in my head a beautiful little sun garden that requires a low hedge like the one above. I even have access to one I could dig and move here. But there is a major problem. Sitting right where I want this garden is a berm with three giant trees - a tulip poplar, a sweet gum, and a second tulip poplar. When we built this house, we carved a space out of the woods, and every tree that could be saved was left standing. When I had a garden designer come in the beginning, she suggested taking out those three trees and flattening the berm (oh, how I wish I had). My husband would not hear of it. He was determined to save every tree. In fact, he insisted on lopping off a planned carport to save a white oak which hovered over the new house. Years after my husband died, a 40-foot-long limb fell from that tree. The oak is now gone, and in its place my arch garden. There is still no shelter for cars. I am off subject here, but I need to explain further. I did apply for a permit to remove the three trees, not because of my vision of a flat, sunny garden, but because the biggest and closest poplar is listing toward the front of my house. Furthermore, the roots of all three trees are exposed, and that worries me. My son-in-law more than once has expressed his reluctance to let his two-year-old daughter and her younger sister sleep in a second floor room that is right in the path of the largest tree. The City of Atlanta did send someone out. I saw him drive up, turn around, sit for about two seconds and then drive off. He never got out of the car and was gone before I could get to him to explain that the top had already broken out of the tree and that several limbs had dropped. The permit was denied. It's silly, but not a day goes by that I don't look at that berm and see a flat, sunny garden filled with sun-loving flowers. You would enter under a rose-covered arch which would free my 'Climbing Iceberg' that has been imprisoned in a container for three or more years. I also have four more roses that would flourish in this spot. They are pillar roses and would need tuteurs. but that would add some height to the space. Right now, the roses are languishing in too much shade. The best part is I could put up a fish-line barrier that would keep the deer out. And, of course, I would have that lovely little hedge. Tomorrow, I have a tree man coming to give me an estimate on a dead hickory in back. I am going to ask him what the chances are I could get a permit for those three trees. 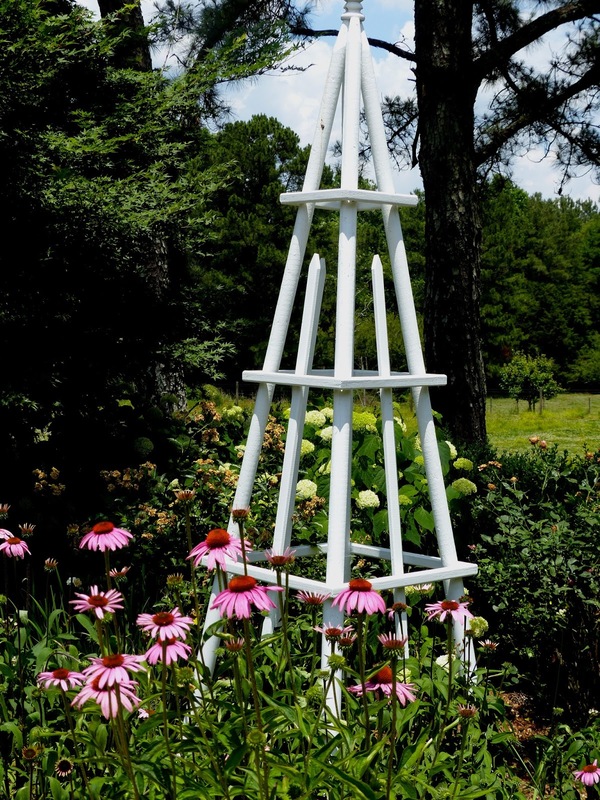 I would love to get this project started and finally have a sunny, although small, garden. September would be the ideal time to move that existing hedge (wonder what my friend will think when she sees it). I don't want to lose the chance of getting it. So, I'll cross my fingers that something will work out, but I may just have to wait for the next big limb to fall. Just kidding! This is Le Jardin de Bagatelle in the Bois de Boulogne in Paris. 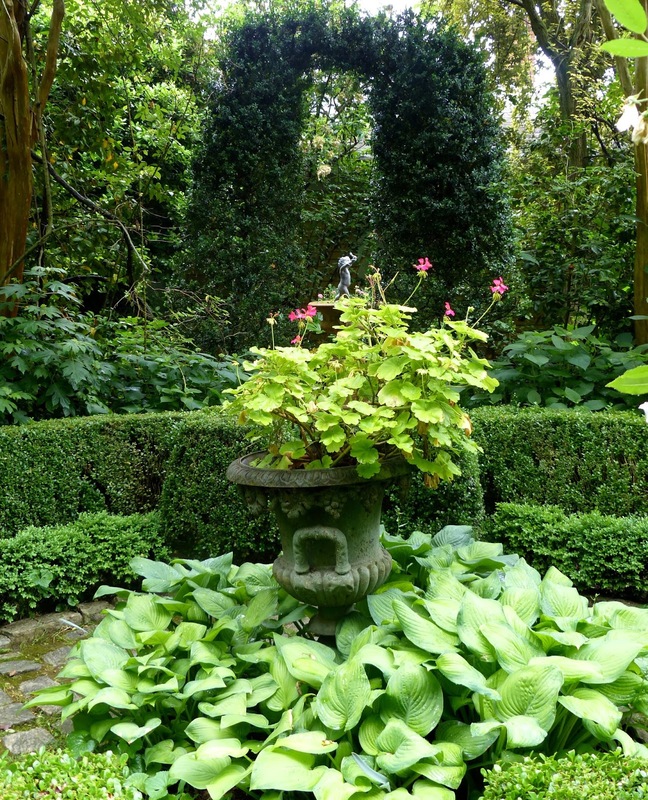 The photo was taken by my friend Carol Tessier, who has her own spectacular jardin on the outskirts of Paris. Note the yellow hoses - wondering about a sprinkler system. Those look very heavy. Plant combinations - carefully planned or happy accident? When we were producing A Gardener's Diary on HGTV, we had fun latching onto phrases that kept cropping up and appropriating them to other situations. For example, in the pilot for the series, host Erica Glasener asked gardener Ruth Mitchell how she had decided on a combination of a bright pink spreading verbena and a prolific low-growing rose (was the rose red? I don't remember!). Ruth answered with typical enthusiasm. "Oh no. I didn't do it on purpose. It was just a happy accident!" After that, the producers and editors had fun calling just about any circumstance that cropped up a "happy accident." There was sort of a competition as to who could come up with the silliest use of the phrase. Later, when I was visiting an Atlanta garden, the owners wanted to ask if I could identify the orange vine that had slipped down into the flowers of their grancy graybeard. I told them it was crossvine, Bignonia capreolata 'Tangerine Beauty.' The gentleman said he had not remembered planting it, but he loved the combination that had somehow come about. "A happy accident," I said, and he agreed, not knowing how many times I had said those words in the past. I have a happy accident about to take place in my little arch garden alongside the house. There is a Japanese holly (the kind that resembles boxwood, but is not as elegant) that has grown up next to a parent plant. For some reason, it has not branched out and has remained fastigiate. I do keep it clipped some so it will remain narrow, and it is now about 10 feet tall. Several feet away I have 'Graham Stuart Thomas' rose, growing on the same line as the holly, both just begging for an arch. Yesterday, I bought a large wire one, which I hope will prove sturdy enough to let me train this narrow evergreen up and over it. From the other side will come the yellow rose. I'm hoping for complete coverage from both sides to smother the arch. While I'm now officially planning this combination, it was truly a happy accident that the holly anomaly came up where it did. I know I'm going to have to jerry-rig some support for the sides of the arch to stabilize it (the holly is strong and stiff and sort of crooked), but I think it's going to be a lovely combination, if I can get it to work. I think I"ll know soon. Below: Some errant roses that fell from the tuteur. Soon they'll all be attached to a new garden arch. My memory is not as good as I thought. I was convinced that we had a later blooming time last winter, due to much colder days in January and February. My camera tells me I am wrong. This photograph of Camellia japonica 'C. M. Wilson', was taken on February 2, 2016, in Margaret Moseley's garden, which now belongs to her daughter Carol Harris. Also, in full bloom that day was Margaret's Daphne odora, several hybrid hellebores, Helleborus niger and Edgeworthia chrysantha, among others. I was forewarned by Carol in January that things were early. She called to say that the Michellia maudiae was covered in fragrant blooms (also that it is now a good 25 feet tall). To illustrate how this warm winter has changed bloom times, I have pictures of this banana shrub/magnolia relative in full bloom on March 20, 2010, along with Daphne odora and dozens of camellias. There was a Spiraea 'Ogon' in flower then, as well. I've noticed they are blooming right now, exactly a month ahead of 2010. We're about to face a week of about 70+ degrees F. Already these warm days have brought things out prematurely. The camellias are all blooming like crazy, which is fine, but I worry about the leafing out of Hydrangea macrophylla. I shudder to remember the Easter freeze of 2007. Everything was killed back by a hard freeze, and we scarcely had any macrophylla hydrangea flowers at all that year. Gardeners everywhere have lived through uncertain times. California has been in what seemed a hopeless drought. Now, damaging storms are hitting the state, along with vicious winds and flooding rains. It's hard to have a garden under such circumstances. Let's hope we don't have a repeat of last summer's above 90 degrees and no rain for months on end. And, if it's going to be so mild now (not good to set peach crops), I'm keeping my fingers crossed so that the really hard freezes in the low 20's and teens will not happen. Today, on my way to a wonderful lecture given by photographer Lori Prosser at the Gwinnett Master Gardeners' meeting (her subject was English and French gardens; I came home wanting to clip hedges and plant all the flowers we cannot grow), I saw two white azaleas beginning to bloom. I want the seasons back like they were when I was in my 30's, when you pretty much knew what would bloom when. This present weather is not right, and I hope to goodness this is not a trend for the future. Note: My Helleborus niger, which threw up a lonely bloom this year, has already started to turn green. Here's one I took in Margaret/Carol's garden on February 2, 2016. I'm writing this three days after I had intended to. It was Valentine's Day evening, and I looked with dismay at my desk - disorganization, chaos, half-worked crossword puzzles, metal filing rack stuffed with papers. I hadn't a clue what they (the papers) were all about - they had been there for months. But, as I was feeling a twinge of sadness - for Valentine Days long past, the exchange of presents (my late husband usually gave me something, however small, made of sterling silver, and I would give him something to do with fishing); yellow roses from a boyfriend who wrote a funny message on the card; my daddy handing me a heart-shaped box of candy wrapped in red cellophane. You can see I was in pitiable, nostalgic mood. It only took studying the bouquet of daffodils I had picked that afternoon to break the melancholy. What was I thinking? Here were the cheerful faces that poets had written about for centuries, that school children had presented to their teachers over the years, with the syrupy liquid seeping through the wax paper around the green stems held in their hands. How lucky was I that all I had to do was walk around the yard and gather some instant happiness. The daffodils (of the genus narcissus; when I was young, we called them jonquils, regardless of the size or what division they were) in my bouquet were mixed, a few having been here long before I came on the property. But, most were ones I've added through the years. Curiously, the early "jonquils" and many of the later, larger ones all bloomed at once this year. This weather has been crazy, with warm spells in January and February more typical of May. In my thrown-together bouquet are some 'Ice Follies.' These are from ones I forced one year, then threw the bulbs on the ground afterwards, with all intentions of planting them. They ended up planting themselves and have spread to make a pretty large clump. Their large faces start off with creamy petals and a pale yellow cup. Then, everything fades to white. My daffodil guru, Berma Abercrombie, who was a founder of the Georgia Daffodil Society, always recommended 'Ice Follies' as a very showy flower for a mass planting. I took her at her word and ordered 50 bulbs to start off with. For some strange reason, I decided to plant them on a bank in the woods way behind the house where no one but the deer and squirrels can see them. They did not take off and spread like the ones I had thrown so insouciantly by the back door. In fact, their numbers have dwindled. I wasn't thinking right; the 'Ice Follies' I planted so far away should be on the hill across the driveway where I could see them from the window by my desk. As it is, I have to trudge past the brush pile and down a steep hill to pick them. Another of the labor-intensive garden mistakes I have made. Now, as to the rest of my desk. I had two of those tall mint julep-type vases. I took some camellias to my mother in the nursing home once, and apparently someone liked the container as much as I did. But this is one of my favorite vases for many flowers. The next occupants will be the dark purple hyacinths that come up every year near said brush pile. These are more bulbs I had forced, then tossed into the ground without much thought. There are pictures of three of my Valentines on the desk. One, you can't see for the glare - that's my husband Chip Tate talking to the novelist Andrew Lytle (in the white shirt). Another is the real Mr. Darcy - Colin Firth. He's in a dark leather frame that I thought suited him nicely. The picture was a gift from my friend Helen Fraser, who always zeroes in on what you would love to have. I can't tell you how many times I have watched the BBC production of Pride and Prejudice. Last week there was an article in The New York Times showing what a real aristocrat of the era would have looked like. Not for me. Colin Firth, you will forever be Mr. Darcy. My other Valentine is represented here by the mirror. You can see the frame - it is distressed black with gold leaf. It belonged to my friend Benjie Jones, whom I lost last June 16th. The mirror, which is huge, has made this room a much better place to be. With the sweet-scented flowers and memories of Valentine's Days past, I soon bounced back and let the daffodils direct my mood. Flowers always help, and these were just the right ones to make my evening, not one of sadness at not having a Valentine at present, but one filled with cheerful remembrances of people I was lucky to have in my life. Below: A neighbor down the street has masses of 'Ice Follies' planted on a hill next to her house. I wasn't able to capture the whole area because the leaves on several beech trees blocked the view. I need a stronger lens on my camera, but I was able to zero in one of the patches that passersby (and deer and squirrels) can see from the street. My mother told me that I should never begin a thank-you note with an apology. Her reasoning was to force me to write immediately so I would have no need for an apology for being late. Well, here I go. I feel so bad that I have not even tried to write something here for so long. Sorry, Mama, but I just had to say it. The more days I skipped, the harder it was to take it back up. As usual, I let Thanksgiving and Christmas overwhelm me. My daughter and her family (husband and girls - 2 1/2 and five months) were here for 10 days. Before they arrived, I was like a whirling dervish trying to dispose of all the clutter I'd accumulated all over the house. At the end, I was doing things like throwing stacks of mail into the spare room and not caring where they landed. And, every year, I try to do too much, decorating-wise. I want everything to look magical, and it never does. I did have a really pretty tree, and I got the wreathes and bows made for the windows, but two pine garlands I bought never got put up. I hung on to them for two weeks after Christmas, thinking I could at least suspend them in my arch garden. I never quite got around to that either, so I finally tossed them onto the brush pile. A waste of my money and someone's labor. So that's it. I have no excuse for January, so I'm making a fresh start now (speaking of waste - so many wasted paragraphs above making all these excuses). The photograph above I took last April in the Sarah P. Duke Gardens in Durham, N.C. I hit at a good time, when so many of the perennials and bulbs were at their freshest. 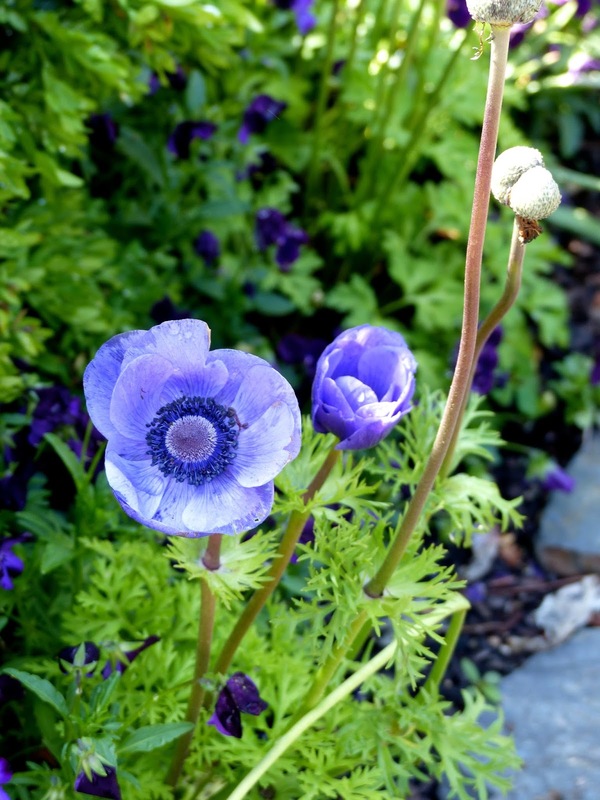 These lovely blue anemones were in the semi-circular, terraced part of the garden, which consists of 55 acres with many trails and tons of ornamental trees and shrubs. In this particular, thickly planted "Historic Terrace Garden" (listed that way on the map), the shrubs and flowers were arranged by color. I never could get an overall view because there were too many people, so I had to settle for close-ups. I love blue in the garden. Yesterday, as Wendie Britt and I were putting out flags for some plantings at the Flower Guild garden at the church, she said the same thing. Afterwards, I went to a big box store to pick up a prescription (they are the only ones who carry this particular one), and I bought a few additional items. As I checked out, there was a stand loaded down with spring and summer bulbs. I spied what looked like a French blue bearded iris. It's call 'Full Tide.' I had already succumbed to this stand a few days earlier, buying two deep purple bearded iris, two packages of Oriental lilies and some purple coneflowers. This is not a good time to plant iris - it should have been done last August. And, the rhizomes aren't very big, except the 'Full Tide' one is pretty decent. I'm planting all this at the church garden since the deer not only eat the fans at my house but pull the whole plant - roots and all - out of the ground. We have only two and a half months before the bearded iris should be in bloom. I think the best I can hope for this year will be a few fans. I will update you on the progress. Meanwhile, my mind is whirling, trying to think of all the blues we Southerners can count on in the garden (how many times through the years did I plant delphiniums? Only once did a few come back. And mecanopsis - one can only dream). I have a friend I e-mail with, and we are always having contests. The most recent one was song titles with the word "moon". So, here's a challenge: Blue flowers you've actually seen in area gardens (not counting bedding plants or tropicals). I'll start off - this is off the top of my head, as I must get this finished: Hydrangeas, of course; blue bachelor's buttons, blue platycodons, some caryopteris are bluish; 'Heavenly Blue' morning glories; Phlox divaricata (usually the blue is a bit pale); Veronica 'Georgia Blue'; blue grape hyacinths; Forget-me-nots; Ceratostigma plumbaginoides; Delft Blue hyacinths; Cantaurea montana; Clematis integrifolia (isn't there a blue one, Lindy? ), Clematis 'Will Goodwin', 'Ramona' (more blue than purple, I think), 'Arabella' and I'm sure many many more blue clematis (Lindy Broder will know them). So, you take it from here. There are some blue Louisiana and Japanese iris. In fact, I had 'Arcadian Blue' at one point (Louisiana). Okay. Finish the list, please. Oops. There's a blue wild aster I see in the fall - other fall asters, but I don't know the names. Elizabeth Dean will. Did I say dutch iris?